The Advantage Air Series is a fully packaged unit with all of the additional accessories customers need included. Advantage series compressors are typically shipped from the factory in 24 hours or less. Compressors are shipped ready to install and operate. Each new assembled unit has a five-year, pro-rated warranty on the compressor pump. ● Convenience. Each package comes standard with up to six, pre-installed options: magnetic starter, auto tank drain, vibration isolator pads, low oil level monitor, air cooled aftercooler, duplex control panel. ● Confidence. Each compressor features a five-year, pro-rated warranty on all pumps and a five-year warranty on electric motors and receivers. ● Cost-Efficiency. Fully-equipped packages mean lower purchase prices and installation costs. ● Configuration. Advantage Series configuration provide maximum versatility in every application. ● Competitive Advantage. Unique features make the Advantage Series more competitive. From its heavy-duty design to its ease of maintenance, the Advantage ● Series exemplifies reliability, durability and quality. Nuvair is a distributor for the complete Champion air compressor line. 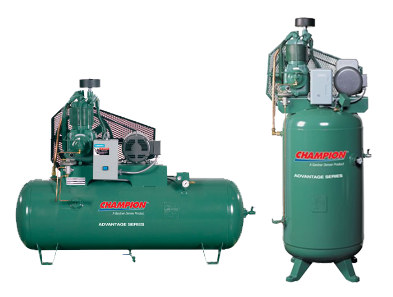 Visit the Champion website compressor products page here Champion and find a model that matches your requirements. Once you have the model or models your interested in shoot us an email or give us a call and we will quote you delivery time and pricing.